Eli Manning didn’t have a great season last year. And if you go by preseason football, he’s not looking much better. But I don’t care what people think. I don’t care if my brother-in-law Mike dangled Eli in front of my face in our fantasy league, proposing a joke trade for my starting wide receiver. I’ll take that trade Mike, and we’ll see who’s laughing come February. Because I still believe in the man that got the job done twice. 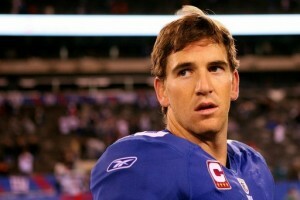 I still believe in Eli. To everyone out there writing off the Giants based on a poor preseason performance, you’re all crazy. Nobody cares about preseason football. Not the players, not the coaches, hardly even any real football fans. The only people watching preseason football are ESPN announcers and statistics junkies. The on-air personalities, at least they have an incentive to pretend to be excited about the preseason. But the junkies? The guys that spend all of their free time calculating odds and constantly trying to put up the perfect fantasy lineup? They’re not even real fans. They’ve transcended fandom, to the point where football doesn’t even look enjoyable, not from their point of view anyway. So Eli didn’t do that great last year. That’s all in the past. And considering their abysmal 0 – 6 start, I actually feel like a lot of their late-season accomplishments went unnoticed. But yeah, any way you want to spin it, 2014 wasn’t a great year for the G-Men. But like I said, so what? Eli had one really bad year. You don’t think it’s possible to bounce back from one bad year? This is a guy that has two championships under his belt. Of course he’s going to bounce back. Let’s at least wait until the first game to start planning his early exit from the Giants. And that brings me to another point. I read some article saying how rumors were leaking from the higher-ups in the Giants organization, about how many were starting to wonder if Eli isn’t in the beginning of his decline as an athlete. From a pure business standpoint, what kind of an attitude is that? Don’t you guys want to make money this year? Don’t you think that maybe you should be encouraging your starting quarterback, giving him a little bit of positive encouragement instead of gossiping behind his back? Why are you trying to undermine your own potential success? Eli sure has a lot to prove, but I think that his history of success has entitled him to the benefit of the doubt following last year. Yeah, offense was terrible in general, but a quarterback can only pass the buck on so much of that responsibility. But until this season starts out in a nosedive like last year, there’s no reason to start automatically assuming that it’s not going to work out. If anything, we should be excited. Because at the very least, it would be really hard to match whatever happened last year. Come on, the Giants have a great quarterback. As a fan base, we need to start acting like it. Eli, if you’re reading this, I just want to let you know that I still believe in you. I know you’re going to have a great year. I had a dream last night where you guys won the Super Bowl. It was awesome. I was sitting front row. You looked at me after a twenty-five yard touchdown pass, and you winked at me. Part of me wishes that I never woke up. And you’re on my fantasy team now. So my success hinges on yours. We’re in this together Eli, and I’m not worried at all. In fact, I’ve never felt more confident about anything else in my life. This entry was posted in Uncategorized and tagged Eli, Eli Manning, football, Giants, New York Giants, NFL, QB on August 29, 2014 by Rob G..